We don’t know how much her Anglican faith frames her thinking about politics and her approach to policy because she doesn’t really talk about it. We can only consider her speeches and examine her record in office. She is apparently a Zionist with authoritarian, illiberal instincts. She hails the benefits of sharia law, and likes to snoop and monitor our use of the internet. She is also inclined to pursue some “bonkers” immigration policies, irrespective of justice, fairness, compassion and common sense. She made lots of Brexit-like sovereignty noises, but eventually backed Remain in the EU Referendum campaign (despite knowing that free movement of persons meant that she could never fulfil the Conservative Manifesto pledge to reduce immigration to the tens of thousands), and then swiftly U-turned on her ECHR views when the path to Downing Street became apparent. She has presided over a largely “dysfunctional system” in the Home Office: yes, she got rid of ‘hate preacher’ Abu Qatada, but on her watch some 758 foreign criminals were released from police custody without checks, and thousands more were gifted UK citizenship. She also volunteered the UK back under the jurisdiction of the European Arrest Warrant, which permits British citizens to be extradited to another EU country, incarcerated in a foreign prison, denied Habeas Corpus and trial by jury, refused an early appearance in court and, contra the presumption of innocence, required to prove that you have not committed the offence of which you stand accused (ask Ben Herdman). This is Theresa May’s record in the Home Office. There is a certain epistemic distance between what she says and what she does. And yet..
Brexit means Brexit, and we’re going to make a success of it. There will be no attempts to remain inside the EU. There will be no attempts to rejoin it by the back door: no second referendum. The country voted to leave the European Union and as Prime Minister I will make sure that we leave the European Union. 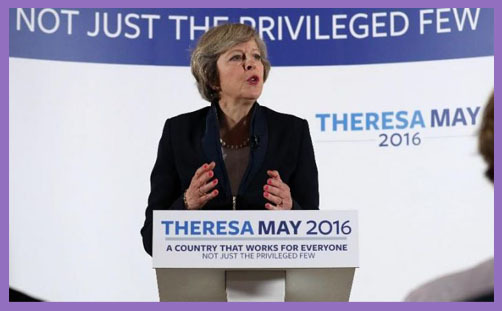 There is a sense in which all that preceded may be overlooked if this pledge is fulfilled. Yes, the foundation of the ECSC/EEC was profoundly Christian in inspiration, with a trajectory toward peace and reconciliation. But the EU has become a sanctified bureaucracy of elitist forces and anti-Christian creeds. It has deified centralised state power while emasculating nation-state subsidiarity. Its coercive, corporatist social order is antithetical to centuries of Protestant notions of individual liberty and economic liberalism. While subsidising its own farmers to leave their fields fallow, poor African farmers are doomed to starve. The loss of national sovereignty (or ‘pooling’ thereof) has rendered the UK Government impotent to pursue righteousness and justice. Let’s not go there. Politic conspiracy comes too easy. There is much joy to be had in the thought that the UK will soon be liberated from the EU by the low-Church daughter of a humble Anglican vicar, steeped in the spirit, ethos, method and attitude of the ever-compromising and reconciling via media. Her instinct is toward balance, restraint and moderation. But she has vision, passion and is not at all risk-averse. Pray for her. Brexit means Brexit. It is her vocation. The destruction of Andrea Leadsom: is it no longer permissible to be proud of motherhood? Why are Church Commissioners throwing more cash at insolvent Diocese of Rochester?